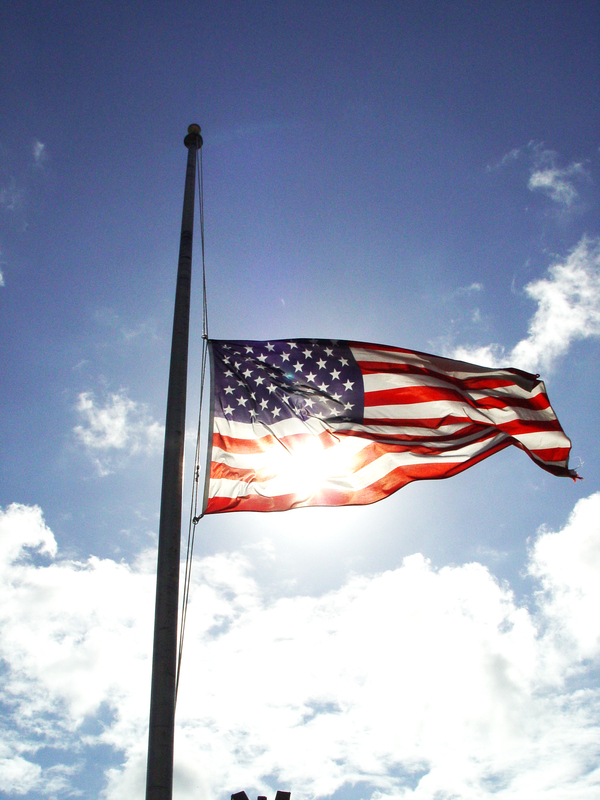 After the September 11, 2001 terrorist attacks, many US Armed Forces members were told not to wear their uniform to and from the office. This was geared, I believe, toward those who served in major metropolitan areas and might take public transportation. It is not uncommon to see service men and women carrying military backpacks. But sometimes, you cannot tell if they are still active duty, retired or if the backpack was purchased from a surplus store. On the afternoon commute home, I ride the train with a Marine, who also gets off at my train stop. He carries a military backpack like a lot of current and former soldiers do. It wasn’t until he was in his uniform that I realized he was still active duty. He is an enlisted man. When I thanked him for serving, his response was classic military: “Glad to do it.” Wow. How many of us say that about our jobs? As I started chatting with him as we waited for the train to pull in to the station, he discloses what I already know: If you want to be a Marine, you must have heart. For those of you not familiar with the military rate of pay, my train buddy who is his mid 40s, might earn $50,000, depending upon his rank, years of service, promotions and MOS (military occupational specialty). Many of our servicemen and women have jobs that don’t translate in to a civilian world. Try spending two or three decades of your life dedicated to a military branch only to realize that what you do has no civilian translation. And let’s not forget about that agreement with Uncle Sam to serve outside the US. These assignments are not always plush or safe either. This Marine served four tours in Iraq. His decompression method when he arrived home: to spend 30 days drunk. On the last tour, his wife cut him off at two weeks. When he drives on the interstate highways, he still sometimes scans the roads for individual explosive devices (IEDs). The last time I checked, these are not job side effects for most of us. Sure, military men and women get decent benefits: healthcare, housing allowance, cheaper prices on base stores, moving expenses, etc. But I can tell you that they do not serve for the money or the benefits. Ever. Some of you know that my Dad was a career military man; 26 years in the US Army. He served two tours of Vietnam. While the road for my Dad was not always smooth, he has no regrets. His choices made him who is he today. His choices made me a proud military brat who still has a soft spot for anyone in the Armed Services. So the next time you think about your job and start to complain (I am including myself in this one too), please remember our men and women in uniform. Let’s be grateful for what we have and put our complaints in perspective. Let’s be grateful for them serving. And, let’s thank them for their choices. Today I was grocery shopping at my local store. 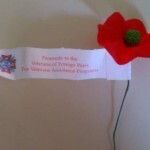 As I exited, the ladies from the Veteran’s of Foreign Wars (VFW) were selling their “Buddy” Poppy. 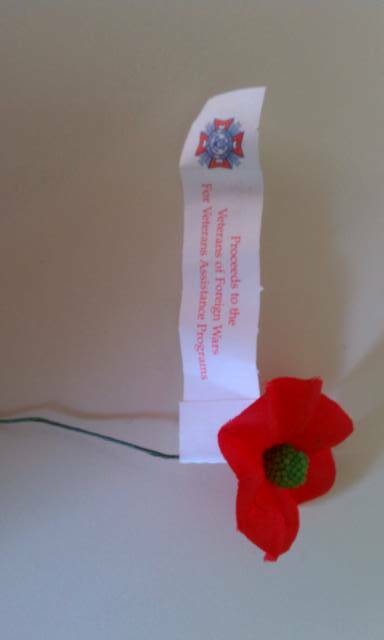 The simple selling point is: “Remember our veterans.” These flowers are assembled in VA hospitals by disabled and needy veterans according to the VFW’s website. A new "Buddy" Poppy to add to my collection. As I do whenever the Buddy Poppies are on sale, I donate and get one for my car or more if my children are with me. All three of their grandfathers, their father, aunts and uncles served in the US military. 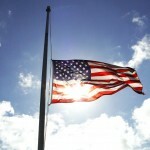 It is a gentle reminder for them and me that someone else sacrificed so that we may live in a free country. Someone else stepped up to serve to help those oppressed in other areas of the world. Someone else’s life was changed forever because of his or her selfless act. The least we can do is donate a couple of dollars. How can someone say no to that? I understand turning down Girl Scout cookies, Boy Scout popcorn or softball team fundraising bake sales. These types of food are not for everyone. Imagine my surprise when a guy turned this down with a polite “no thank you.” It took all my adult patience not to march in to the store after him and speak to him. Who knows. Maybe he works for the VFW and has hundreds in his garage. So, this weekend when you see someone selling the Buddy Poppy outside of your local stores, please stop and donate. Surely you can spare $1 for a veteran.